Nature NB’s 2017 Festival of Nature is now over for another year. Nature NB would like to thank the participants, all 212 of you, for coming and celebrating all that New Brunswick nature has to offer. A special thank you to all of our leaders who volunteered their time and expertise to make sure the field trips were well planned, to our breakfast volunteers and silent auction donors and Kouchibouguac National Park for hosting us for the weekend. In total, the Festival of Nature raised close to $5,000.00. All funds will be going directly to our education and conservation programs. If you would like to stay up to date on our ongoing and future projects, you can subscribe to our e-news for monthly updates, or consider supporting us with a donation. 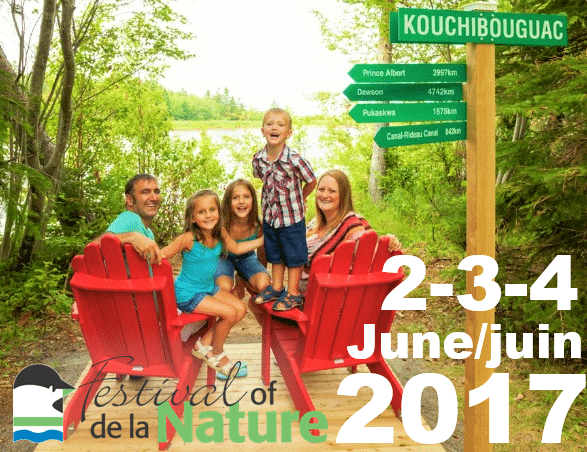 Nature NB is already in the planning stages for the 2018 Festival of Nature in Bathurst. To help us improve we would like you to participate in a short survey to let us know what went well and what you would like to see at future Festival of Nature events. Don’t forget to stay up to date on all events, news and projects by following and liking Nature NB on Facebook, Twitter, or Instagram!